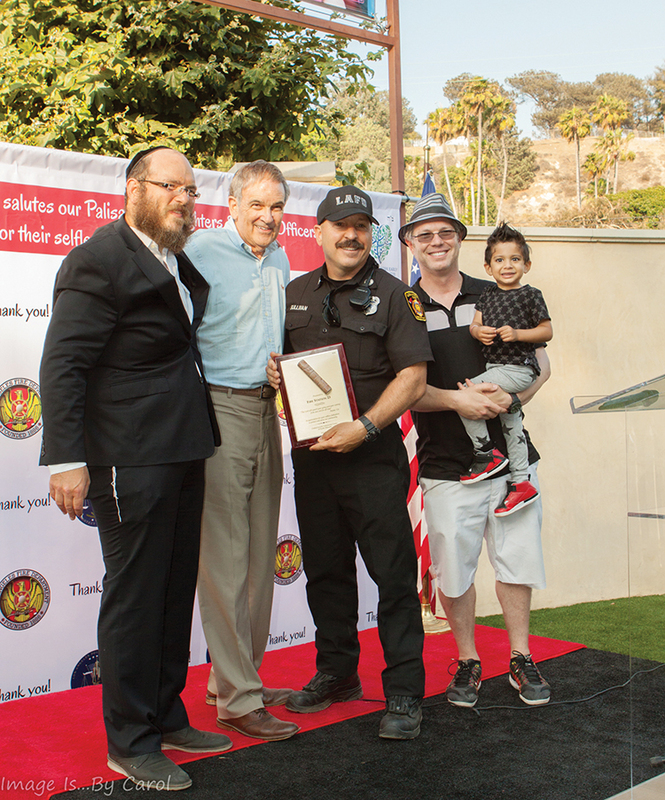 It was a special event at the Chabad on Sunset Boulevard on the evening of July 31, as hundreds of Palisades residents gathered to honor firefighters from Station 23 and 69 and local Los Angeles Police Department officers. After Rabbi Mendy Hecht sang the national anthem, Rabbi Zushe Cunin addressed the crowd. “It is our pleasure to thank the firefighters and police publicly for their service because they put their lives on the line for us,” Cunin said. “It’s not often that we have the opportunity to express our gratitude. They serve our community, including our children and seniors and all of us in between. They do this with total dedication and caring. Rabbi Zushe Cunin, Chamber of Commerce Executive Director Arnie Wishnick, Station 23 Fire Fighter John Sullivan, and event sponsor Darren Enenstein and son Max. “We have been told that since January 1, 49 firefighters and 70 police officers have been killed across the United States,” said Cunin, who then presented plaques of appreciation to both fire stations and the LAPD. Honorees included LAPD Officer James Lavenson; LAFD Captains Robert Bates, Daryl Mitchel and Chuck Ferrari; Station 23 firefighters Tai Trinh, John Sullivan, Andre Zimbeck, Tom Oberto, Donn Thompson, Jon Bowers and Joe Couce; and Station 69 firefighters Lou Torres, Steve Hazard, Mark Glenchur, Richard Tucker and Yvonne Rodriguez. Chabad member and fire cadet Daniel Field was also honored as his mom Eva Field looked on. Guests and residents wrote messages on The Gratitude Wall, which contained three large 3-foot by 3-foot posters printed with the emblems of each station and the LAPD with the message “We Salute You.” Attendees wrote their personal messages directly onto the boards. After a barbecue meal, the messages were taken down and given to the firefighters and officers to be displayed in local stations as a reminder of community support. It was mentioned that many Pacific Palisades residents have received assistance from these dedicated men and women. While adults visited with the honorees, children were treated to table games, face painting, a bounce house, a police vehicle (complete with flashing lights) and a fire truck. Rabbis Cunin (wife Zisi), Hecht (wife Shternie) and Eli Beitelman (wife Elka) helped to plan the event with a committee of our staff and volunteers. The event was inspired by Darren and Susy Enenstein, who also served as sponsors. Visit chabadpalisades.org for more information.